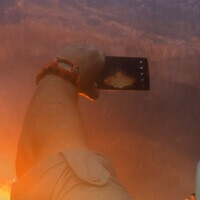 Taking a page from Nokia’s playbook, LG commissioned nature photographer Jung-won Park and adventure film maker Geoff Mackley to take the new G3 up the hill and take a look at a live volcano. Obviously, such an adventure means showing off the G3’s camera. However, they manage to plug other features of the new flagship along the way. As luck would have it, Park “just happened” to run into Mackley at the top of the volcano, and they teamed up to take some pictures with the laser-focused camera, augmented by OIS+. Given that volcanos are basically tossing up molten lava, making new earth, the plastic construction of the G3 seems an odd choice for such an assignment. Still, the picture quality that is shared from the adventure on Ambrym Island in the South Pacific is remarkable. In fact, volcanos are sources of pretty neat pictures all around, but taking the marketing crew on such an adventure wins a few extra points. As we shared in the review of the LG G3, the new flagship has a lot going for it, but if you have small hands, or even normal sized hands, you may find the device to feel a little bulky. However, the new interface is a winner, the camera is sweet, it has great battery life, and that screen, oh that massive screen with QHD 1440x2560 resolution make for a device that should definitely be on your list to consider. Depends on how you mean, you dont need to use the touch -> focus -> snap, there is "normal" autofokus too, but you still need to press the camera button on the interface. Or there is voice command that works pretty well. OMG, im getting an lg g3 now! awesome! g3 is way better. HTC m8 if only they did not use the Ultrapixel gimmick. Both using 2Gb Ram, is kinda old. The Note3 and Z2 both have 3Gb Ram. A big turn off. Only 2Gb version available in Europe. Are you buying it? I see. wasnt aware of that sorry. i am from malaysia. part of Asia. So i presume the 3gb will come here but not sure when. if you give me a choice, i would not buy it yet. Will wait for Note 4 to release.